I hope, being a developer everyone needs to debug their code at least once a day even if it is a very small snippet. Frankly speaking, sometimes it becomes very frustrating when we are looking for a value of particular property or let’s say very few properties of a huge object and it gets TIMEOUT. Uhhh !!! Now first question is, is there any way to display customized message in debugger window? Answer would be YES. One simple override method will do this job for us. Point to understand here is, by default Visual Studio uses ToString method in the debugger. 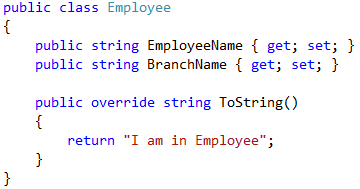 Please note, overriding the method will only display the message and it won’t affect the values of your employee object. In other words, on click on plus symbol in debugger window, you will still be able to view employee’s branch and name. Well, it’s time to move for next question which I feel is very important concept. Second question is, is there any way to display value of required property instead of customized message? Again answer is a big YES. A simple attribute named DebuggerDisplay will rescue you. One can use this DebuggerDisplay attribute with classes, enums, delegates, structs, fields, properties as well as with assemblies. When to use this DebuggerDisplay attribute? One certainly can’t use it all the time due to its maintenance overhead. I would recommend it to be used at class level and can be at properties level, if your properties are complex and less self-explanatory. Enjoy debugging!! !